The concession to develop Manoel Island together with Tigné Point is based on a tender issued by the government in 1993, with the deed of em-phyteusis endorsed unanimously by both major political parties in Parliament and signed in June 2000. The deed includes payments by Midi of €274 million, of which €60 million represents premia to the government, €181 million in ground rent for the duration of the lease and €33 million for restoration and infrastructural obligations, and has annexed to it an outline development permit clearly stipulating the mix of residential and commercial building volumes. Contrary to the assertion made in the media, we categorically state that Midi is fully compliant with the financial obligations of the concession. Midi engaged Foster & Partners, one of the world’s leading architectural firms, to design the master plan, which remained extremely faithful to this deed. They were selected due to their extensive experience in designing sensitive projects, such as the redesign of the German Reichstag and the redevelopment of Marseille’s Old Port and Trafalgar Square. In projects of this nature, Foster & Partners rehabilitated the buildings and their environments to ensure maximum accessibility to the general public while respecting the heritage context. Last week, Midi invited important stakeholders, including Din l-Art Ħelwa, Flimkien Ghal Ambient Aħjar and the Gzira local council to provide initial feedback on the new master plan for Manoel Island. Given that we are still in the planning stage, we will consider all constructive feedback on the project. We believe that certain criticisms following these presentations was unfairly negative, did not represent the facts and was dismissive of the many benefits of the master plan. 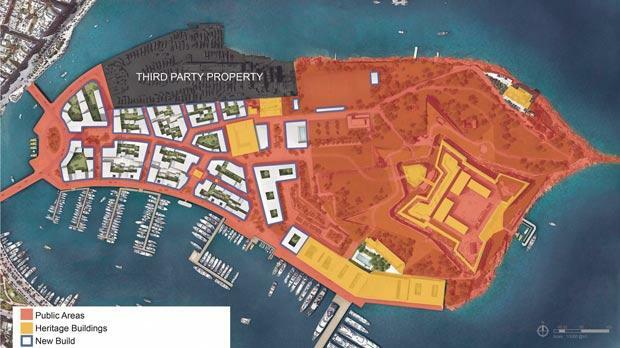 In fact, the Manoel Island master plan does not only include improved public access to the entire foreshore, but shall also provide a number of open piazzas, museums and sports facilities, as well as an 80,000-square-metre family park for public enjoyment. Of direct benefit to the Gżira community and the general public is the inclusion of extensive public sports facilities. Contrary to speculation, the development will not in any way reduce or restrict the safe swimming areas currently enjoyed by the public. Furthermore, the master plan does not include a ‘shopping complex’ as was implied in the media. While the deed with the government prescribed a casino, we are still in the process of evaluating the sustainability of including one in the development. Furthermore, the island will be predominantly of pedestrian priority and car free. The restoration of heritage sites like Fort Manoel and the Lazzaretto to their former glory requires a substantial amount of investment, which is only viable if it is underpinned by a level of commercial activity. The use of heritage buildings is vital for their maintenance and sustainability, which allows us to create a unique destination for the enjoyment of all Gżira residents, the general Maltese public and visitors. Luke Coppini is CEO of Midi plc.